My day started off pretty typical of a day off to visit one of our local attractions, SandCastle in Pittsburgh. We got everything together to travel to the park and we arrived at 11:05, pretty much on schedule. We parked and we went to the front where we stood in line for over 30 minutes for bag check. You can’t really travel to SandCastle without a bag as a parent because you have towels, water bottles, sunscreen and in my case a bag of medical supplies for my one son. 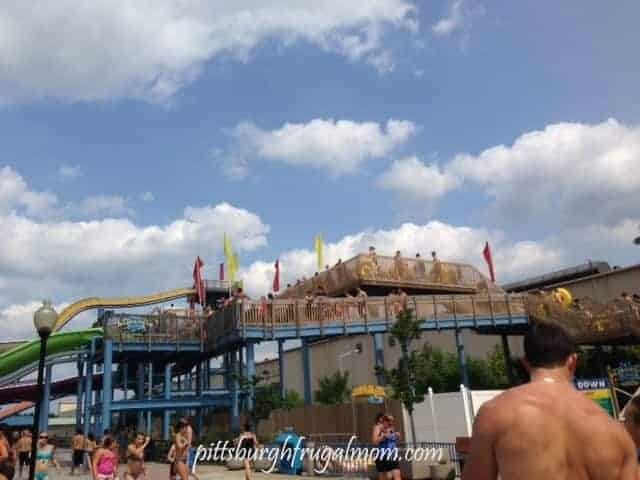 In case you have not been, SandCastle is the Pittsburgh Waterpark that lets you slip and slide the day away in everything water from a Wave Pool to Tube sliding both with tubes and without. 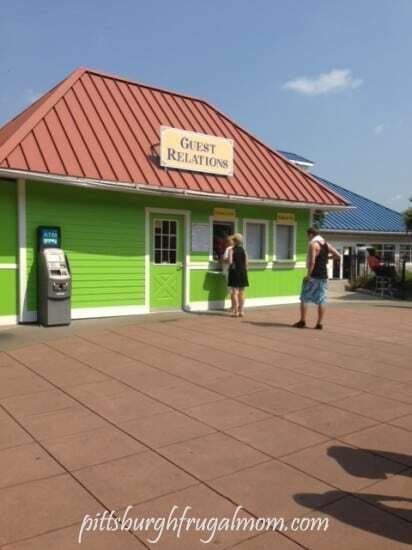 The weather was perfect as you can see from the Guest Relations Ticket Pick-up photo. The crowds were not horrible, but most chairs were filled. If you have a group of kids, on average, I would say 10+ and up that want a great day out, where you know that if you are just there as a check-in point, my guess is at the end of the day, you will be toting home a bunch of tired kids. We spent the day there, 6 kids, sun, pools, tubing and waves and at the end of the day, I brought 6 kids home, tired, and a bit ‘sun-kissed’. The boys rode everything and in many cases they rode the same things over and over because they loved it that much. As a mom, I was happy that they could go around, have a central meeting point and then have a great day without being ‘over-tended’. The park offers the perfect mix of freedom with security that it is not exceedingly huge, so you can often separate, yet bump back into one another. As for foods and beverages, things have changed a bit and that caused a bit of conversation in the lines, as some people were aware of this and some were not. 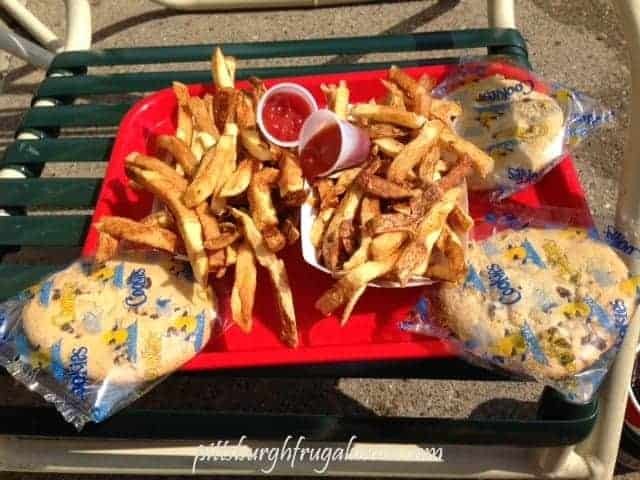 I had read the website before we left and with all my son’s allergies, I was relieved to see I could bring food into the park. While you can’t wheel up that cooler you have become accustomed to pulling in Kennywood, you can bring food in, which is an overall bonus. As the mom in front of me put it, ” I worked all day yesterday to make sure that me and the kids, had $60 for food and snacks”. Her family was 3 big, and her price line was pretty accurate. Dipping dots are on average $5, Drinks average size are almost $3, Fries were $5 and change, and chicken and fries were $7 and change. If you like big cookies, they are $1.25, Brownie Parfait Sundaes were in a small cup with big brownie chunks, and averaged $4.50+. At the end of the day, the kids went up to Dippin Dots, but many flavors were gone, so grab your snack before 4p. This I have to share and while it may not be the NORM, it happened and it was a bit odd. In this case, as a blogger, my true and honest opinion might be best reserved for my stories that we talk about around the fire pit to my friends about our adventures we go on, but I actually have to share my day with you. It is what happened in line that started a bit of chaos throughout those waiting in line that actually amazed me as a parent, but, I guess nothing should. There was suddenly a puddle that was not swimmer-friendly. As we were just about at the security check, steps away, 3 people away actually, there was a tree that was being openly urinated on, and there was NO WAY that the Sandcastle security officer could not see this because the child was to the right of him and EVERYONE in the line was screaming, “Oh My G#$”, “hey, that kid is peeing in the tree” and so on. The parents were standing right there, laughing as the child, continued to pee, and pee and pee as though he had never gone before. He turned around and was naked, and his training diaper was around his feet and he said, “ok, now I am done!”. The lady in front of me, called the parents out, and everyone was just kind of frozen, in disbelief that this child did this to the tree. Now, just as the kid got done peeing, turned around at all of us, and announced his ending, a man walked through the tree, and puddle that had happened. I know one Water attraction puddle we would not be near! That being said, off to the pool. One word of caution to those moms that get annoyed when they get ‘splashed’ when sitting next to the pool wall: Don’t sit there with your phone and get upset with kids who are swimming. You are at a pool, the kids are there to swim and move if you don’t want wet. I can’t believe a lady hollered at kids for splashing in the pool because she was texting. There are many places you can sit and work on your phone, but next to the pool will require splashing, giggling and general chaos, so accept it or move! We went to the water rides and grabbed the tubes and began riding. There were tube rides, and also body slides. The Lazy River was only letting you ride DOWN the river and not back up, and the line was huge, so unfortunately we did not get to enjoy that ride, but we did spend time riding the waves which was a lot of fun. It is so funny to hear everyone get so excited when the waves start and leave when they finish. I had purchased a Souvenir Cup at Kennywood, where we were apparently misunderstood that if you bought this cup you could use it at all of the Kennywood properties for .99 refills. As we quickly came to find out, via a cashier is that the refills in this cup, purchased from Kennywood for $9.99 were .99 at Kennywood, but $1.99 at their park because they were not making money on them, but if I preferred to purchase an additional $9 cup from their park I would then be eligible for .99 beverage refills. 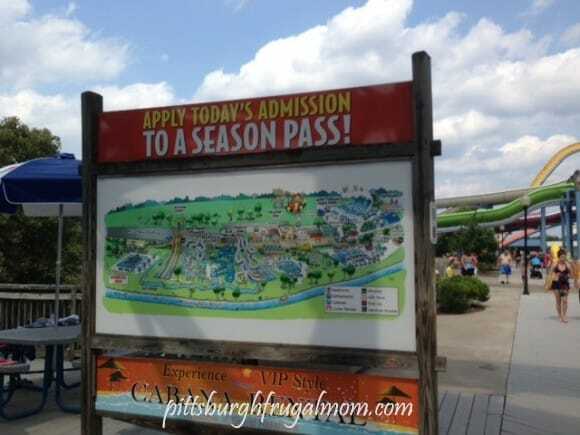 Hmmn, Pittsburgh Frugal, I think NOT! I could have saved the toting and just purchased an equivalent medium beverage. 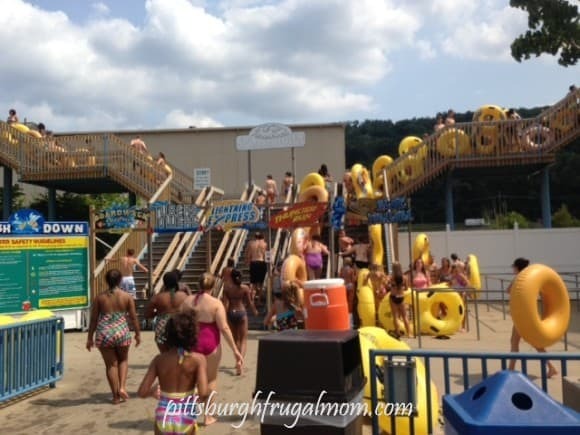 This park is a great park for Pittsburgh Parks, as it offers a great way to cool down and a great environment for families. Plan on paying for parking, regardless of where you park, it’s all PAID parking at $5. Your bags will be searched and you will stand in a line that takes a while to get through(a lot of people were grumbling about the line sizes). Get there when they open, or wait at least an hour, because this should help with the entrance lines. There are plenty of chairs, pools and fun attractions. Can the whole park be covered from the time they open until the time they close? Absolutely. Without lines the park is actually something that the kids could complete in just a few hours(the rides), but if you are there for the pools you can relax all day. If there are lines, you will wait a bit, sometimes we waited for up to 20 minutes as you have to wait for the pool areas below the tubes to clear before you can proceed. Make sure you pack sunscreen, a small cooler with sandwiches, drink and snacks. There are lockers, they are $13 and you get a few dollar refund upon returning the key. Theses lockers are in the main area, if you want a smaller locker that costs a bit less, you head over by the wave pool. The lockers make it easy to stash the stuff you don’t want to carry around. A Medium sized locker can fit a nice sized bag, a backpack like bag. Your day will begin at 11 and end by 5, which is enough of waterpark time. DO make sure to find a discounted pass so you don’t have to pay the full admission price. Many schools offer discounts for purchases ahead of time as do municipalities. You could always call SandCastle and see what specials they have as well.